Design has traditionally sought to produce the best outcome(s) possible—artifacts, systems, services, experiences, or interactions—without exploring other opportunities and consequences. Design research and practice are increasingly expanding beyond a decidedly formal focus, manifesting as emerging design disciplines, transdisciplinary practices, and mindsets that bring co-creation, experience, and systemic approaches to design processes. Traditional design education models that focus primarily on form-giving are too ideologically narrow or practically inflexible to address this type of expansion. 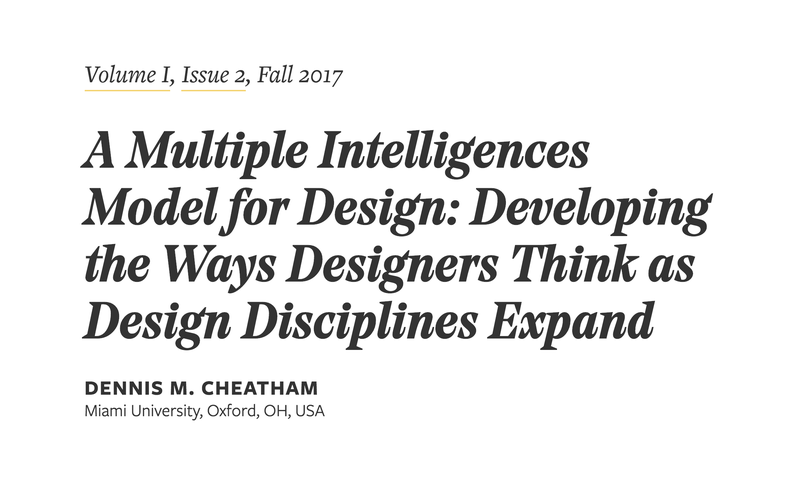 As designers seek to develop innovative solutions to increasingly complex matters by synthesizing concepts from disciplines not traditionally associated with design, a new framework is needed to facilitate a more inclusive and expansive type of design learning. This essay explores the current state of traditional (i.e., artifact-centric, production-minded) design education, and makes a case to adapt it to an array of recent changes in the areas of design research and practice. A spectrum of design mindsets is defined and explored to clarify different ways designers frame their thinking to consider usability, co-creation, experience, and systemic relationships when researching and developing in emerging design areas such as transition design, service design, and experience design. An overview of Multiple Intelligence theories is provided to support a proposed framework for design education called the PACES Multiple Intelligences Model for Design (PACES = Practical, Analytical, Creative, Emotional, and Social). PACES components are described in detail, and examples of how these can be effectively applied to support the needs of contemporary design educators and students are shared. This essay concludes with a report of what has been learned after a yearlong implementation of PACES in an American, university-level communication design program.